Empty spray bottle for using with wipes solutions and cloth baby wipes. High quality 4 ounce spray bottle. We are offering these very inexpensively as a convenience for our customers to help make using homemade wipes solutions easier. Keep a bottle filled with distilled water for rinsing or for making fresh (washable, reusable) hand-and-face wipes. I use the clear one for water; the blue one for homemade wipes solutions. I find that having colored bottles makes it easy for me to know what is in each bottle. These are cosmetic-quality bottles which really are better than the ones in stores, in our experience. 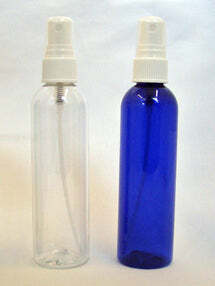 We are not a wholesale supplier of spray bottles. Purchases are limited to 3 bottles total per order. (To clarify, that does not mean 3 of each color, it means 3 bottles total per order, such as all 3 of one color, or 2 blue and 1 clear, for example.) Made of PET plastic which is a commonly used soft drink container plastic. We use the Lotion Potion concentrate (which is an oil) mixed with water. This little bottle doesn't leak, hasn't clogged, and simply does it's job. Perfect size for diaper bag, as well. What more can you ask for for 95¢? This is actually a replacement for one I had years ago. Its very convenient to have a little water or whatever you like to use right on hand. They hold up well and don't leak. I've never broken one and I'm pretty sure I could still use the old ones I had if I knew what I did with them. But its always nice to have a nice new item to stock your diaper area/bag. Works better and much more portable than the massive cleaning style spray bottle we started with.